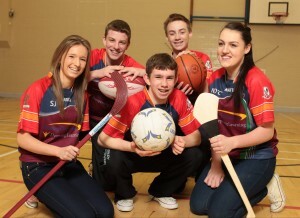 Pupils are pictured wearing a new shared jersey which they unveiled today [20th December 2012] at St Paul’s High School Bessbrook during the Sharing Classrooms: Deepening Learning (SCDL) pupil consultation. The three-year project involving St Paul’s High School Bessbrook, Newtownhamilton High School and St Joseph’s High School Crossmaglen is part of a series of ground breaking initiatives developed through the International Fund for Ireland’s Sharing in Education programme. Managed by the Northern Ireland Council for Integrated Education (NICIE), the SCDL Project is designed to create an inclusive environment in increasingly diverse classrooms. 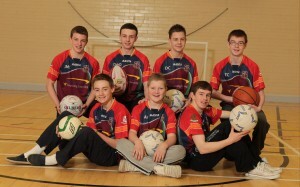 The new jerseys were designed by the shared BTEC Sport class as part of the project to build a group identity and promote affiliation for students from the three different participating schools. During the SCDL consultation more than 30 pupils, parents, teachers and educational body representatives gave feedback on the project and shared their experiences. “The group of fifteen students come together every Thursday for the whole day in St Paul’s High School, Bessbrook, to study B Tec Sports together. In an effort to encourage greater integration and to create a unique sense of shared identity for the group, the idea of designing a specific uniform was posed by staff in June. With the support of the SCDL team and the expertise of the Art and Design department, a workshop was facilitated in September, during which the team of students designed a template for a sports jersey which incorporates the school crests of each of the three schools. The students are very proud to be launching their jersey as part of today’s SCDL pupil consultation, and they look forward to wearing the jersey as a sign of their friendship and shared identity. The International Fund forIrelandis an independent international organisation established by the Irish and British Governments in 1986. The Fund’s main objectives are to promote economic and social advance and encourage contact, dialogue and reconciliation between Unionists and Nationalists throughout Ireland. Contributors to the Fund are theUnited States of America, the European Union,Canada,AustraliaandNew Zealand. Since its inception, the Fund has committed more than £668m/€838m to a wide variety of projects inNorthern Irelandand the southern border counties. Developing and funding initiatives that tackle segregation and promote integration to build a lasting peace in Northern Ireland and the southern border counties is a key priority for the Fund. Funded by the International Fund forIrelandand managed by the Department of Education, the Sharing in Education Programme seeks to break down the barriers from our historic conflict by providing a range of opportunities for young people to learn and work together. By supporting a variety of strategic projects that enable young people to participate in shared educational experiences, the Programme helps to facilitate reconciliation for a shared future. The Fund’s Sharing in Education Programme seeks to break down barriers from Northern Ireland’s historic conflict by providing a range of opportunities for young people to learn and work together. 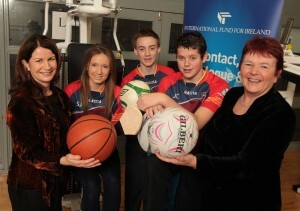 To date over £16m has been invested in SiEP which was launched in 2008.